The son of a Chinese father and Tagala mother who lived in the Parian district outside the city walls of Manila, Lorenzo Ruiz married a Tagala like his mother and had three children -- two sons and a daughter -- whose descendants are currently residents of the same area where the original Ruiz family lived. In 1636, Ruiz was implicated in a murder. He sought help from his Dominican superiors who believed in his innocence. In order to escape what they believed would have been an unjust prosecution for their protege, the Spanish friars immediately sent Ruiz on a missionary expedition outside of the Philippines. Initially, Ruiz thought he was being sent to Taiwan, where he believed his Chinese roots would enable him to start a new life. Little did he know that he and the missionary expedition led by Fray Domingo Ibanez was actually headed for Nagasaki, Japan, where feudalism was fanning the flames of Christian persecution. Lorenzo Ruiz was headed straight into the arms of death. He was arrested almost immediately upon his arrival in Japan in 1636, and subjected to torture by his Japanese captors for more than a year. Tied upside down by his feet and dropped into a well where sharp stakes lined the bottom, his torturers would stop just before he would be impaled, and thereupon try to convince him to renounce his faith. “Deny your faith and we will spare your life,” his persecutors said. To which Lorenzo Ruiz answered, “I will never do it. I am a Catholic and happy to die for God. If I have a thousand lives to offer, I will offer them to God.” Existing documents attest that the Japanese promised him a safe trip back home where he could be reunited with his loved ones, but Ruiz staunchly chose to remain faithful to his religion. On September 22, 1637, Ruiz, Fray Domingo and their 14 companions were led up a hill overlooking the bay of Nagasaki. There they were hung upside down with their heads inside the well. Their temples were slit open to let blood drip slowly until they died either from loss of blood or asphyxiation. Many died after several days. Ruiz died last, on September 29,1637. Beatified by Pope John Paul II in Manila and later canonized on October 28,1987, San Lorenzo Ruiz holds the distinction of being the first person beatified outside of the Vatican. 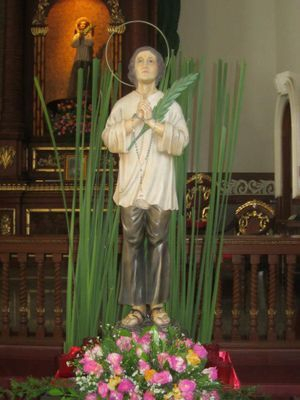 He also holds the honor of being the first Filipino saint, the “most improbable of saints,” as Pope John Paul II described him during the canonization ceremony. When Pope John Paul II came to Manila in February 1981 to proclaim the beatification of Lorenzo Ruiz, he also included in the lists of martyr beatified underwent martyrdom in 1633, 1634 and 1637 - for the same motive, for proclaiming their Christian faith. Thus, of the 17 beatified, 10 were Japanese, 2 Spaniards, 1 Italian, 1 Frenchman. Ten were Dominican Priests, two Dominican brothers, two Dominican nuns, and four lay persons. Only Lorenzo Ruiz was married and head of a family. O Lord my God. You created me, and You sent Your only Son to redeem me. I am truly sorry for having offended You. My God, my Lord and my Father, whom I adore above all things, I intend to make amends for all my sins and promise to approach the sacrament of penance as frequently possible. I hope for your pardon and strength in honour of Your Holy Passion and sacrifice on the cross. Amen. O most merciful and almighty God, You bestowed as a gift to Lorenzo Ruiz the strength to wind stand the overpowering forces of death for the sake of his faith in You. Through his prayers, help us to follow his example by overcoming by all life's trials and eventually, increase our hope and love in You. O St. Lorenzo Ruiz, You brought honour to our country, having been a level-headed and prudent father of the family, a witness of Christ in your life until your death. We present all our petitions to God through your help so that by our actions, we may know more and love more Jesus our Lord and Saviour. We humbly implore your intercession in this novena, for the infinite glory of God and in honour of your triumph as a martyr of Christ and defender of Christianity. St. Paul said in his letter to the Romans: "Who shall separate us from the love of Christ? Shall Tribulation, or distress, or persecution, or famine, or nakedness, or peril, or sword? As it is written, 'For Your sake, we are being killed all day long: we are regarded as sheep to be slaughtered', " No, in all these things we are more than conquerors through him who loves us...nothing else in all creation will be able to separate us from the love in Christ Jesus our Lord". St. Paul wants to impress this thought upon us: If a man loves God, he will try to overcome all difficulties for His sake, like a man doing everything for his beloved. St. Lorenzo Ruiz denied himself and surmounted all trials, suffering, hunger, persecution and death as proof of his faith in God. This is the ultimate reason why love for God prevailed in St. Lorenzo Ruiz's life. In our case, what is really important in life is who are we following as example. (Pause for a while, reflect on the examples of St. Lorenzo Ruiz, and mentioned all your petition). Dear St. Lorenzo Ruiz, you showed yourself to be a responsible father of your family: you chose to live in midst of suffering. Look with gracious eyes upon our family that is now beset with crisis. You had been loyal as a servant of the church by fulfilling your duties to God and the fellowman; inspire us to be loyal too to our commitments. You had been a hard working member of parish Organization; teach us to take an active part in parish activities and become worthy instruments of Christ in works of charity. You had been firm in your faith in Christ which was why you chose to die for his sake: help us to be brave and fearless defenders of Christianity. (Pray one Our Father in honor of the Holy Passion of Jesus Christ). (Recite the act of contrition and the other prayers as on the first day). We can show our love for God in action, not just in words. We can manifest this love to Him if we do things according to His will and fulfill our obligations to Him and to our neighbours. Like St. Lorenzo Ruiz, let us offer our life to God as the greatest sign of our love for Him even if we experience so much hardships in the hands of the enemies of our faith. Let us assume all our responsibilities in honour of St. Lorenzo Ruiz. (Pause for a while, reflect on the examples as St. Lorenzo Ruiz and mention your petition. Then proceed with the act of Supplication and one Our Father as on the first day). According to our Lord Himself, whoever follows in His footsteps shall also suffer hardships and even persecution in reparation of sins. In the midst of suffering, one's moral strength and steadfastness in truth are put to test. By this, there is assurance that all other hardships that will come by will be overcome. But, by avoiding or even complaining against life's difficulties, one's heart is weakened. Victory in anything - in life, in the field of science, education, economics, morality - can only be achieved with the price of hardships and suffering. (Pause for a while, reflect on the examples of St. Lorenzo Ruiz and mention your petition. Then proceed with the Act of Supplication and recite one Our Father as the first day). (All the prayers and instructions to be followed are the same as those of the first day). "Do not commit murder; do not commit adultery; do not steal, do not accuse anyone falsely; respect your father and your mother; and love your neighbour and yourself." The young man replied: "I have observed all these commandments. What else do I need to do?" Jesus said to him: "If you want to be perfect, go and sell all you have and give the money to the poor, and you will have riches in heaven. Then, come and follow me." Are we of the same disposition as the young man in the gospel? Do we also obey the commandments of God and fulfill obligations to our family and neighbours? We all want to be holy but do we follow the counsels of Jesus conveyed to the young man? There are still murders, acts of adultery, thefts, and robberies, slanders and curses around us. Let us strive to avoid such acts as they will hinder us from the road to eternal life. ( All the prayers and instruction to be followed are the same as those on the first day). The gospel according to St. Luke (14:25-27) says that a big crowd followed him in his preaching. Then, He Turned to them and said: "Whosoever comes to me cannot be my disciple unless he loves me more than he loves his father and his mother, his wife and his children, his brothers and sisters, and himself as well. Whoever does not carry his own cross and come after me, cannot be my disciple. Two points are conveyed to us by this gospel narrative. First, that in following Christ, we should love Him more than we love our spouses and families. The meaning is that we have to love God above everything and everyone else. Of course, we should love all others, but never at the expense of God's love and commandments. The second message is that we have to bear our cross with joy. It is the cross and the way we carry it that characterize our disciple of Christ. There can be no disciple or follower of Christ who can be worthy of His love unless one bears the cross. Who avoids the cross given by Christ is like renouncing Christ the crucified. St. Lorenzo Ruiz has given us an example of loving Christ 'till death. (All the prayers and instruction to be followed are the same as those on the first day). In the gospel according to St. Luke (21:12-19), we are reminded that if Christ suffered for love of us, we should not be surprised if we suffer some persecution, for Christ our master showed us example. He told His apostle: "Before all these things take place, You will be arrested and persecuted. You will be handed over to be tried in synagogues and be put in prison; you will be brought before kings and rulers for my sake. This will be your chance to preach the Good News. Make up your minds ahead of time not to worry about how you will defend yourselves, because I will give you such words and wisdom that none of your enemies will be able to refute or contradict what you say. You will be handed over by your parents, your brothers, your relatives, and your friends; and some of you will be put to death. Everyone will hate you because of me... Stand firm, and you will save yourselves. The grace of God, Christ has assured us, will be sufficient to sustain ourselves in the midst of suffering and persecution, for it is for His sake that we bear hardships and difficulties. St. Lorenzo Ruiz is an example of how we should not worry about what to say when we are slandered, or what to do in the presence of persecutors. By our example of strength of soul and heart, we also preach the gospel of love of Christ. (All the prayers and instructions to be followed are the same as those on the first day). The book of Wisdom tells us that the just are protected by the hand of God (3:1-5). They will triumph over every form of hardship. "According to the fools," the book says, "the just will die. They think of death as curse and the last breath of man as the end of everything. The truth is, the just will be in peace and at peace. To the eyes of man, they are punished, but the truth is, they are enjoying life eternal. The little suffering that they undergo will be compensated with great blessing for they have proven themselves worthy of the love of God." The biography of Lorenzo Ruiz narrates that he started to suffer punishment for his Christian faith on Sept. 21, 1637. He was brought to the judge who asked him about Christianity. and he answered: "I am a Christian and I will remain to be so until death; to God alone shall I offer my life. And if I would have a thousand lives, I would still offer them to him. So, do to me as you please." St. Lorenzo Ruiz was then put to death by "hanging in the pit." What an example of fortitude in the face of death! We, too, shall commit ourselves to the love of God and neighbour until the end of our earthly life. "My dear friends: Do not be surprised at the painful test you are suffering, as though something unusual were happening to you. Rather, be glad that you are sharing Christ's suffering, so that you may be full of joy when His glory is revealed. Happy are you if you are insulted because you are Christ's followers. This means that the glorious Spirit, the Spirit of God, is resting on you ...If you suffer because you are Christians, don't be ashamed of it, but thank God that you bear Christ's name." Indeed, it is only through a trial of one's faith that a follower of Christ will deserve the name Christian. The genuineness of gold is ascertained in fire. The truth of Christianity is tested and verified and enhanced by challenges and trials. St. Lorenzo Ruiz proved that faith is tested when one is challenged to renounce it with promise of physical freedom and temporary happiness. We know that the saint showed us the way to everlasting happiness- when he gave up earthly life for eternal life. We can go through similar tests but we have to rely on God's grace and assistance. Without Him, we cannot do anything. With Him, we can even withstand persecution. Our Lord's gospel according to St. Luke reminds us of the need for perseverance in order to attain salvation. Jesus said: "In those days, you will be hated and persecuted for my sake; and you will suffer and even die. Many will renounce their faith and there will be mutual hatred. They will also betray one another. False prophets will arise and they will be able to mislead many. Evil will spread, while the love of many will tepid. But he who preserves shall be saved. The Good News will be preached throughout the world, and there will be stalks about the Kingdom of God so that He may be known to men. Then the end will come." If we look closely into the life of St. Lorenzo Ruiz, we will realize that he was not one of those harboured hatred against others. He preserved in the acknowledgment of his faith. His death could be said to be a fold of preaching to Good News of salvation. It behooves that as his devotees, we all follow in his footsteps so that we may likewise attain, through perseverance, eternal salvation. Copyright 2003-2013. Web Development Ministry, San Lorenzo Ruiz de Manila Parish. All Rights Reserved.